There are many times when you want to have some text link to another web page, either on your own website or on the Internet. 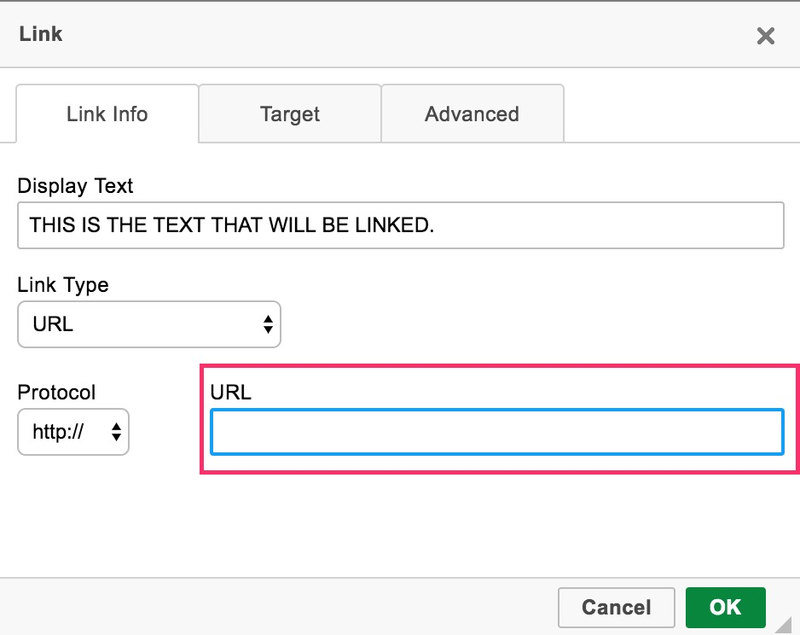 Here are the instructions on how to create "linked" text that will take your visitors to a specific webpage when they click on some text. Go to the page, gallery, or image where you want to insert your "linked" text. You will see our standard 'Content' text editing box. Depending on where you are, it may be called 'XYZ Content' or 'Description' or 'Additional Text', if you are working with an image or gallery. Click inside the 'Content' text editing box and put your mouse cursor where you want to insert your Text, i.e. the words you want to link. Type the words you would like to be "linkable". In the URL field (red square box above), type in the full webpage or website address for the place you want your visitors to go to when they click those words. In the URL field, type: mailto:Name@EmailAddress.com. Be sure to scroll down and click 'Update' button to save your changes!